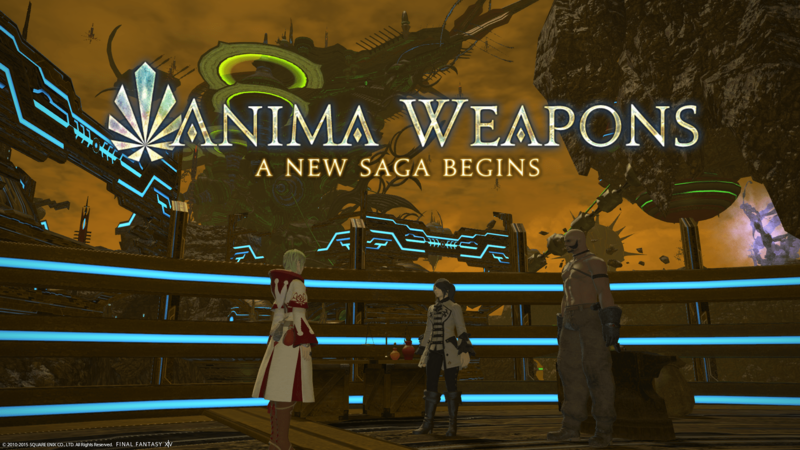 The time has come for a new weapon to be born upon the world of Eorzea and as of today I have started the next epic quest for the relic weapon. So to start with it seems these new relic weapons take on the form of the Esoteric weapons so I am now including the Seraph as apart of the relic quest line. So in a quick nut shell this relic quest is the mastermind of someone called Ardashir and Gerolt who wants to create a new weapon from anima (which is mostly the life stream energy originally was used to teleport) with the ultimately aim of giving life to a weapon (can you recall another weapon like that? No, think harder. No? Nirvana Reborn!). So we head out to speak to Rowena (who also has an interest in the weapon for money reasons) who advises to speak too Synodony. When I arrived to Synodony she explains that to complete the process I will need aspected liminous crystals of every element in stacks of three but also believes in another way: That out in the world there is a Zodiac weapon and that would also serve the purpose well. So wanting to get on it I decided to give her my Nirvana Zeta and let her have her way with it … but then I saw this…. I would have to say that honestly my heart did not skip a beat – I could not allow the Nirvana to end there and that both the Thyrus and Nirvana has gone through so much and likely much more to go (although I am very likely wrong, I am hoping that seeing the Anima and Zodiac weapon are both living things they will allow the Zodiac weapon to be upgraded in future like how it worked in Final Fantasy XI). Everything that A-Towa-Can’t did in his time wielding the Thyrus. Everything the “Near Eastern hierarch” did with the original Nirvana (although this may not count). Madman Whisper Road that I crafted and used to battle in Castrum Meridianum and The Praetorium. Then to use the very same weapon until I could get my hands onto the Ifrit Cane in which time it was used to become the Thyrus’s base weapon. Hydra, Ifrit, Garuda, Titan, Ramuh, Odin. Caduceus, Allagan Defense System(s), Twintania, Rafflesia, Melusine, The Avatar, Nael Deus Darnus. Shiva, Ravana and even Bismarck. Angra Mainyu. Five-headed Dragon, Howling Atomos, Cerberus, Cloud of Darkness. Imdugud, Kaliya, Louisoix (while transform as Phoenix) and even Bahamut itself! In other words this weapon has always been my preferred weapon and always been my go to glamour in its latest form … and I could not bear to see it end here. While I doubt it will be upgradable in future – I would hate to simply hold a replica of the weapon and use that as vanity knowing the very weapon I spent ages working on was broken up simply for a weapon that in time will create its own history – while ending the Nirvana! So with that in mind refusing to let the Nirvana be wiped out, I decided to farm for the luminous crystals and in the end I collected them all and now have the two Astral and Umbral crystals I needed. Returning to Synodony and Gerolt a new base weapon was created and in my hands I now hold the Animated Seraph Cane. So let the new saga begin. To a new non-stained legend!